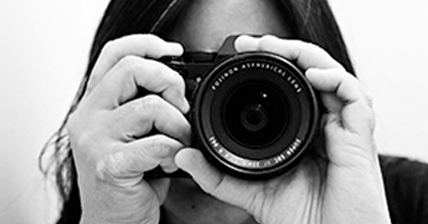 Update, March 2014: I’m sad to hear the news that Xanthi has closed. 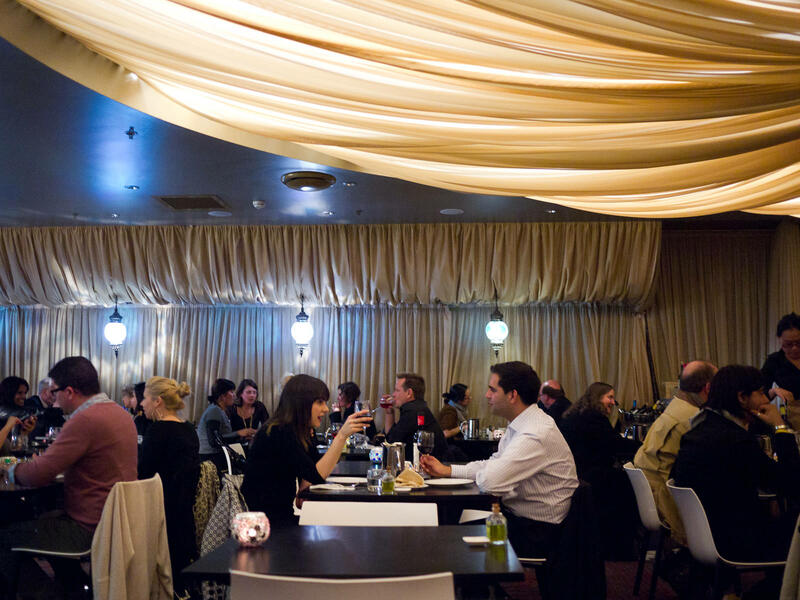 4 September 2012: Congratulations to Xanthi, a new One Hat restaurant in the latest Sydney Good Food Guide. I’ve been to Westfield Sydney on a number of occasions and enjoyed the upmarket food court and restaurants Spiedo and Chinta Ria…Mood for Love. Xanthi Bar and Restaurant is located on Level 6 next door to Spiedo. I had the pleasure of being introduced to Xanthi chef David Tsirekas on one of my previous visits and promised I would return to dine at his restaurant. Several months later, I got the opportunity. The night before getting on a plane to Vietnam, I met my friends Craig and Caroline for dinner at Xanthi. It was a typical gathering of friends who haven’t seen each other in a while, are chuffed to be in each other’s company and eager to catch up. Despite our best efforts to focus on the menus before us and decide what to order, we kept getting sidetracked and started telling stories. 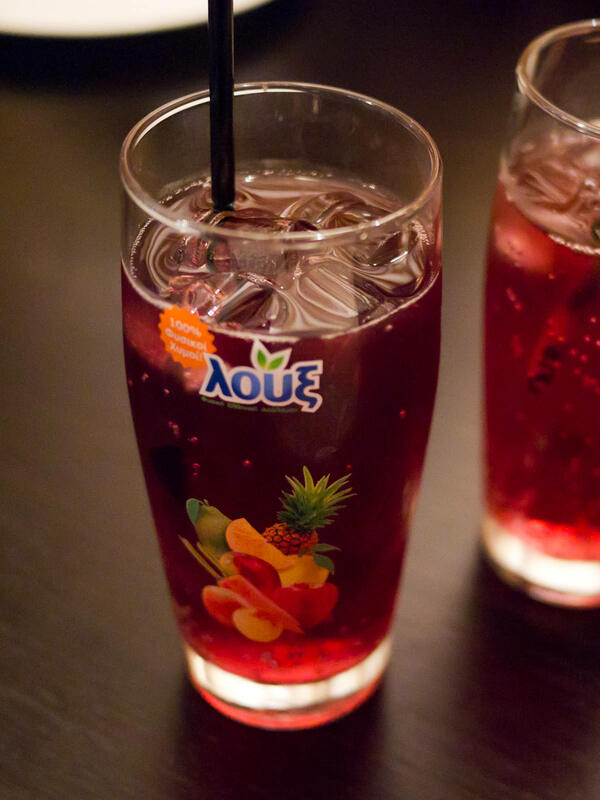 We eventually agreed on several dishes to share, creating our very own Greek feast, and ordered Greek sparkling sour cherry juice all round. 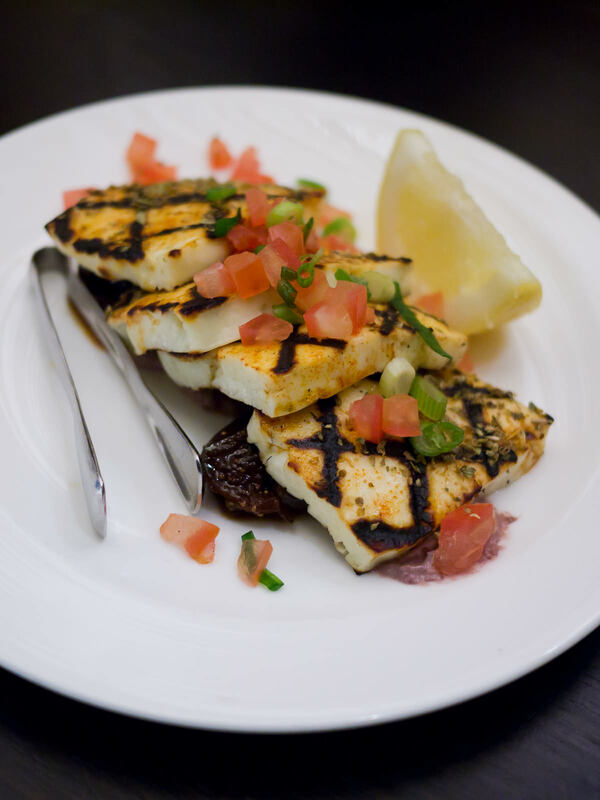 First to arrive was the barbecued locally made Cypriot haloumi served with diced honey peppered figs, all topped with diced tomato and chopped spring onion. The grill marks weren’t just for show – the cheese had a wonderful charry flavour and the characteristic haloumi squeak with every chew. 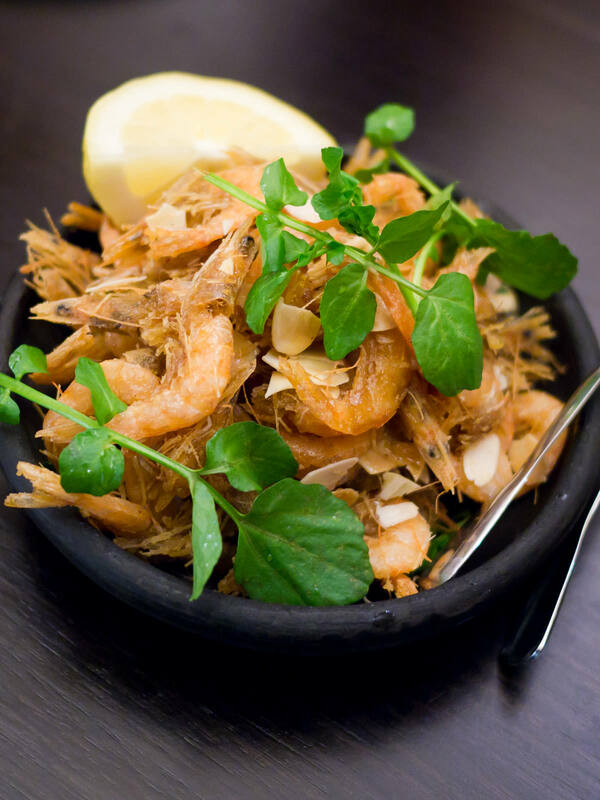 Next, deep-fried school prawns coated in a classical ancient Greek sauce of garum (fermented fish sauce) and honey, with a sprinkling of flaked almonds. These tasty little guys can be eaten whole – shells, tails, faces and all. And gosh, they are moreish! Forget peanuts – this would be a smashing snack with beer. Three magic words: pork belly baklava (AU$21). 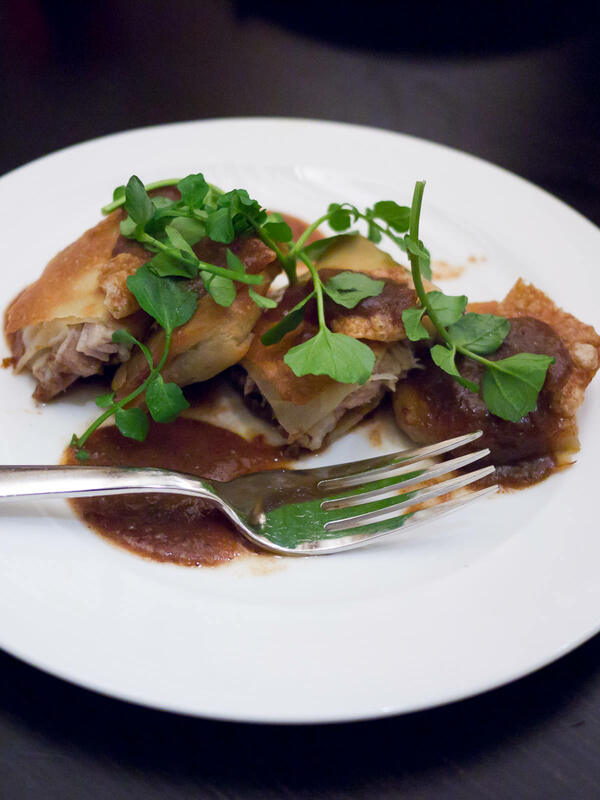 One of chef David’s unique creations, the dish consists of succulent pieces of pork belly wrapped in crisp filo pastry with a date and pistachio filling and a sweet date mastic sauce. And yes yes YES – on top of each square of baklava, a piece of crunchy pork crackling. It’s indulgent and very rich. The filo pastry is hand rolled to order, baked fresh and served straight from the oven. The menu warns that wait time can be up to 30 minutes, but as we had other dishes that came out first, we didn’t notice a wait at all. The meat from the spit (250g $38 / 500g $70) comes highly recommended and servings are limited so get your order in quick. 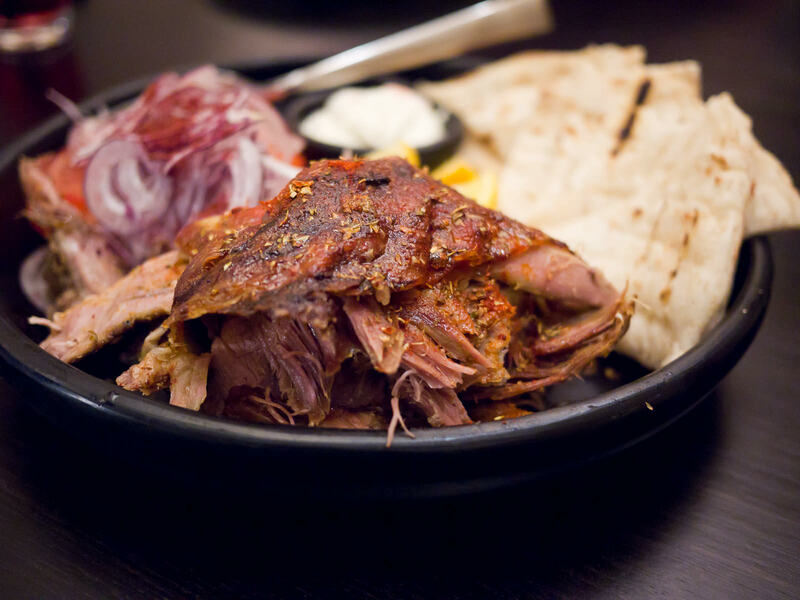 On any given night it will be either lamb, pig or goat – tonight it’s lamb. 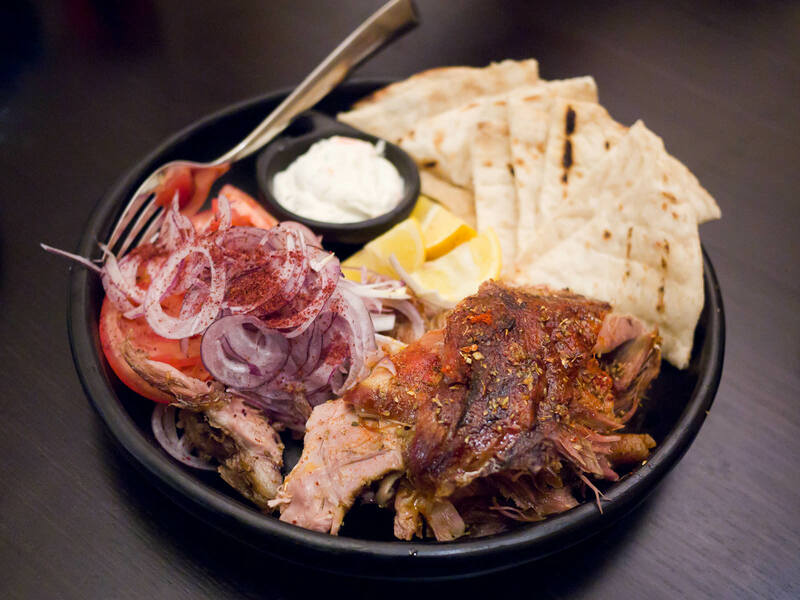 The sliced meat is served with toasted pita bread, sumac spice sliced tomato, onion, tzatziki and lemon wedges. This was a feast on its own. I couldn’t wait to try the caramel baklava ice cream (AU$15). 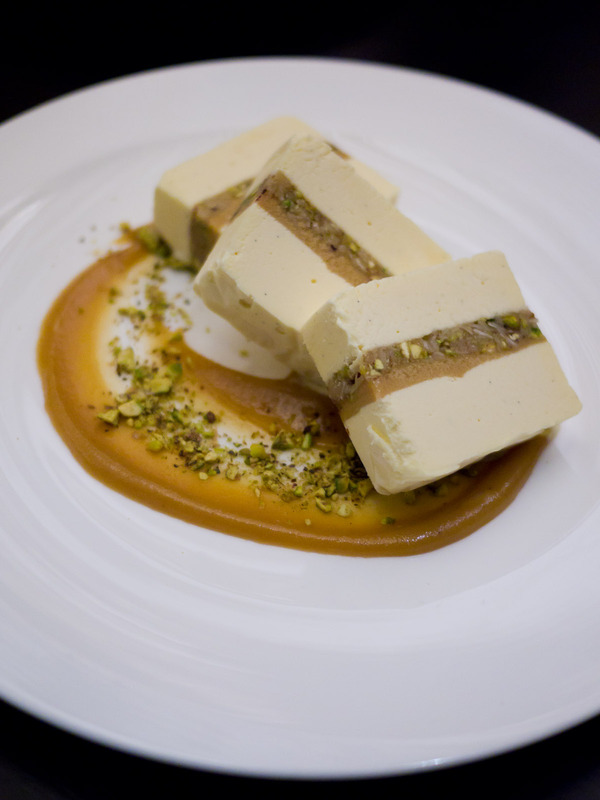 Each serving was substantial: three thick slices of vanilla bean ice cream with layers of caramel fudge and baklava nuts, served with a smattering of crushed pistachios and more caramel. 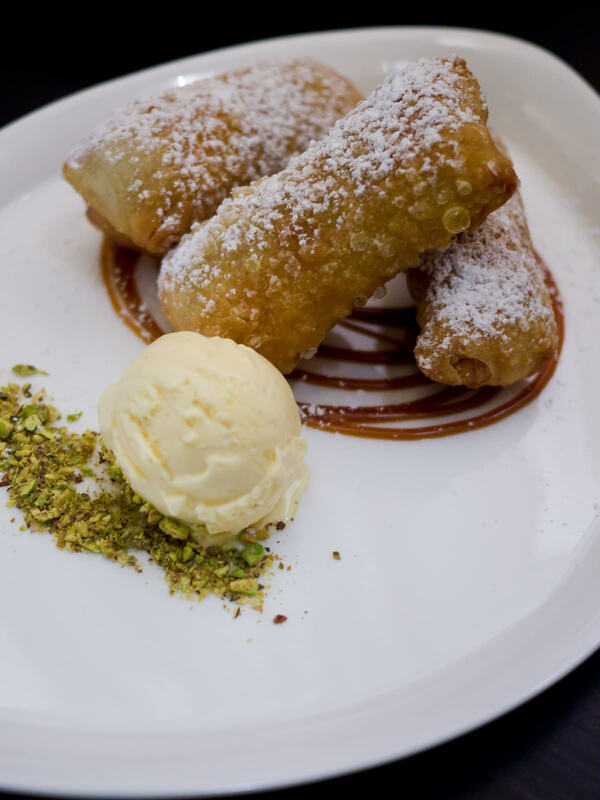 To our surprise, chef David sent out a complimentary serving of banana fritters – the bananas were rolled and baked in filo pastry, served hot with crushed pistachios, caramel sauce and mastic ice cream. The pastry was all bubbled like McDonald’s Apple Pie, which I found very appealing. Watch out for molten banana! It was a generous, delicious table of plenty, perfect for sharing with friends. Negotiations over the carving up of the last square of haloumi and the last precious piece of pork crackle were all part of the fun. Service was excellent. I’m sure we could’ve stayed talking until kicked out the door, but Craig and Caroline had to work the next morning and I had a flight to catch, so somewhat reluctantly, we called it a night. There’s excellent dining to be enjoyed at Westfield Sydney. Like the other restaurants I’ve dined at on Level 6, Xanthi offers a welcoming, comfortable ambience away from the shopping centre humdrum. Hopefully next time I dine at Xanthi, I’ll get the chance to taste the pig or goat on the spit. I suspect I will also be tempted to order baklava, baklava, and possibly, baklava. 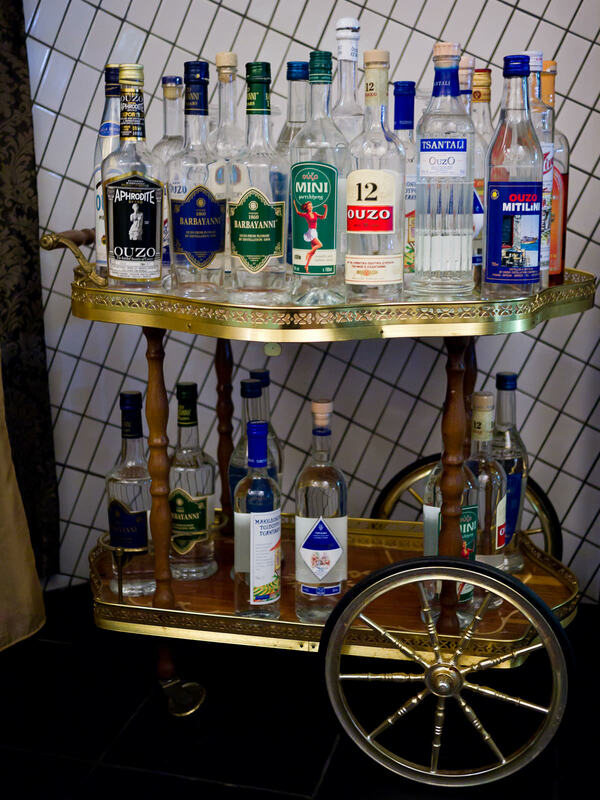 Note: there is an ouzo cart. Update, March 2014: Xanthi has closed. *My words entirely; Xanthi doesn’t officially refer to doubles or triples.